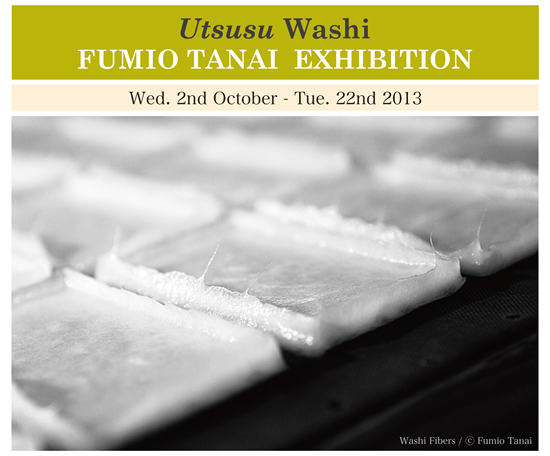 The Consulate General of Japan in New York is thrilled to present "Fumio Tanai's Photo Exhibition: Utsusu Washi - Echizen Washi (Japanese Paper) Village" at the Japan Information Center Gallery from Wednesday, 2nd October through Tuesday, 22nd October 2013. This exhibition is a part of our continuing introduction of the Japanese culture program. ※ All visitors must pass through the security check. Please bring a photo ID with you. According to legend, a mysterious goddess appeared at the upper part of a river out of nowhere and taught the village how to make paper about 1,500 years ago. Even though there are lots of paper villages everywhere in Japan, Echizen Village is an exceptional area. Born in Tokyo, received a degree in Photography from Tokyo Polytechnic University. He had numerous exhibitions at galleries in Paris, New York and Tokyo, including joint shows with Robert Frank and Daido Moriyama. Mr. Tanai received honors such as the International Photography Awards, Prix de la Photographie Paris and an Art Fellowship from the Japanese Government. Discussion: Fumio Tanai & Curator / Show, Paper making, Film / etc. Please join us Wednesday, 2nd October, 2013 for the opening night from 6 pm to 8 pm, with the artist & paper craftsmen in attendance at JaNet.